Sanwa has received international acclaim since they created the “Garyubai” brew 4 years ago. Thier sake do have to be tasted every year as they are quite original even in this Prefecture. Rice: Gohyakumangoku 90%, Yamada Nishiki 10%. Taste: Short tail. 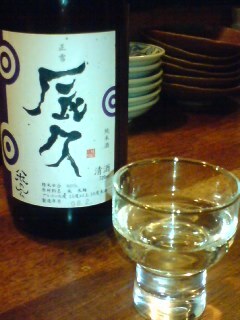 Strong and pleasant alcohol backed by junmai tingle. Dry. Pineapple, apricot, almonds. Overall: Drinks very well with any food. Varies little with food, occasionally sweetens and turns milder. A bit “macho” but very pleasant. Sugii Brewery is noted for producing some the most traditional sake in Shizuoka Prefecture. Their “kimoto” and “yamahai” have received national acclaim in many specialized magazines such as the March edition of “DANCYU”. My good friends at Nagashima Saketen always call me as they have arrived! The title “Tenbo 13 nen” means the 13th year of Tenbo Era (1843) shortly before the advent of Meiji Era, the year of the Brewery foundation in Fujieda City. A return to its roots and orignal brewing! 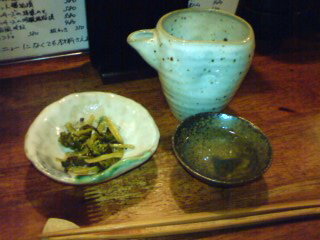 Overall: A sake for food, especially fried and strong taste food. 2 or 3 days ater opening the bottle the sake will actually turn gentler and sweeter, and “performing” with food. It has been a long time since I tasted a brew from Fujinishiki Brewery in Shibakawa Cho. When I saw that particular bottle in Matsukaya Department Store, I did not hesitate as for all their production, these are not always easy to find! Aroma: discreet. Sesame, biscuits, brown sugar, almonds, walnuts. Taste: Dry, welcome acidity. Short tail. Almonds, nuts, walnuts,coffee beans, macadamia nuts, bitter chocolate, black sesame. 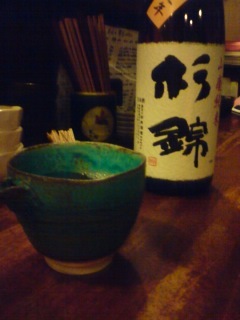 Overall: Unusual taste for a Shizuoka sake. Goes well with food, although taste tends to vary quickly from sweet to somewhat acid and dry. Katayurimo is the third member of a triumvirate I have a special liking for in Shizuoka City. I have already introduced the other two, Odakkui and Hana Oto whose “masters” shared dinner with me in the company Mr. Mori at Kodarumatei. Yukata Mori opened his izakaya (can you guess the connection between names?) in May 2005 and already seems to have acquired quite a following as the place will be full by 21:00. 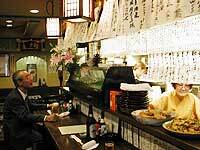 As he is working on his own with a waiter or waitress to serve a maximum of 9 at the counter and 12 at the tatami tables, do not expect shogun service in spite of his ever-smiling welcome. It’s all slow food there! There is plenty to drink, including a fine kome/rice shochu (Acha no Tsubone) by Hana no Mai Brewery in Hamamatsu City who printed a private label for Takayurimo. 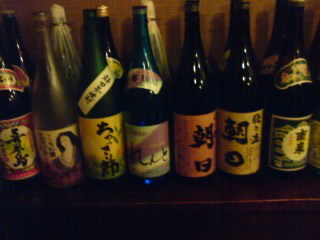 You will find more shochu, sake and so on to please veryone. 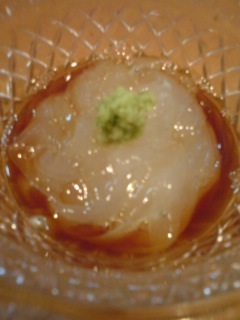 As for local Shizuoka Jizake, it tends to vary almost everyday. I was lucky enough to drink from a bottle of junmai called “Susono Katsurayama Shiro” by Fujinishiki Brewery (Fujinomiya City). I felt the more pleased for it as it was a first! As Mori-San takes his time carefully preparing your orders, you can usually expect two different kinds of ‘”otooshi/snacks” to come with the first drink order. I certainly relished the home-made “kuro hanpen/black sardine fish paste” served slightly boiled and cold with a dah of wasabizuke (wasabi pickled in sake white lees), all from Shizuoka Prefecture! The next snack was “noresore/conger eel whitebait”, usually a specialty from the West of Shizuoka Prefecture, which had to be imported from Fukuoka this time as it is already out of season down here. 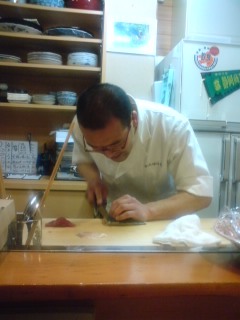 Just enough to help me wait for the sashimi of the day! “Katsuo/bonito” from Shizuoka Prefecture. Soft, tender and juicy! “Saba/mackerel”. Great freshness, no “fishy” taste whatsoever and plenty of “fat”! “Houbo/Blue Fin Robin” from Shizuoka Prefecture. A comparatively rare variety in Japan, served in top notch French and Italian restaurants. 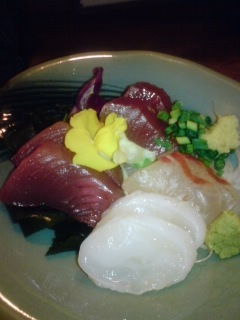 But sashimi is still best! “Seguro Iwashi/Seguro sardine”. So fresh and almost sweet. 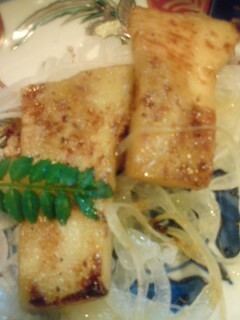 Th e latter morsel was served with orange vinegar from Hamamatsu City instead of the usual shoyu/soy sauce. I was about to “call it a day” as the night was still very young (I had another “appointment”) when I could not help notice the day’s menu board boasting bamboo shoots cooked in four different ways! I can hear Foodhoe salivating! I was not the only one to be intrigued as three of my neighbours joined me in querying Mr. Mori about it. The poor (still smiling) gentleman found himself ordered to prepare the bamboo shoots (from Asabata in Shizuoka City) in the four different ways advertised! No way he could escape as we all had de facto agreed to share our orders! Talk about natural unconcerted ganging up! Incidentally the one I asked for (see above) was the “steak style”: it had been boiled to the right softness beforehand and kept in a cool place. It was first cut to size then cooked and served hot. 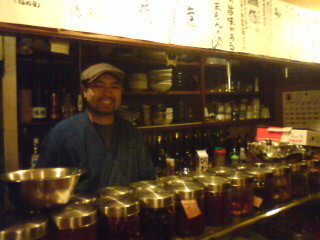 You can’t beat a good izakaya when it comes to instant friendship (and hard work for the master!)! Shizuoka is certainly witnessing a remarkable revival of its traditional izakaya thanks to many youn(ish) enterprising restaurateurs, but some “old hands” are still leaving their mark on the local gastronomic scene for the benefit of all. Mr. and Mrs. Yamamoto, who are well into their seventies, opened Oikawa no more than 11 years ago, proving there is no set age to start new ventures! The popularity of their izakaya has never abated since it opening, and I can tell from personal experience that you had better make reservations on weekends! One reason for their popularity lies in their proximity to Shin Shizuoka Center, but conveniently located in a fairly quiet side street and less than 15 minutes walk away from Shizuoa JR Station. The owneres and their staff are very warm, if busy, individuaks who will take the time to introduce the food and drinks they serve and answer any questions. And if you happen to come from outside our Prefecture you will definitely feel the need to ask a few! Sashimi are seasonal only, and if I were you I would not bother much with the menu and just ask for the chef’s recommendation of the day. You just cannot make a mistake! “maguro/tuna”, “Hirame/sole”, “Shime saba/pickled mackerel”, “Shirasu/Sardine whiting” (freshly caught in Suruga Bay) and “Yude tako/boiled octopus”, with plenty of locally grown vegetables. 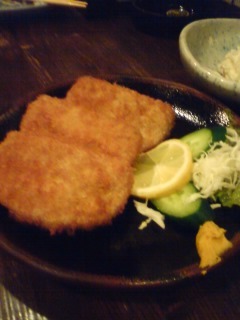 “Kara-age kuro hanpen/deep-fried sardine fish paste, a Shizuoka specialty. Tenpura: the one featured above is “Ashitaba plant”. Any tenpura of the day should please you as vegetables are supremely fresh and plentiful in Shizuoka Prefecture. 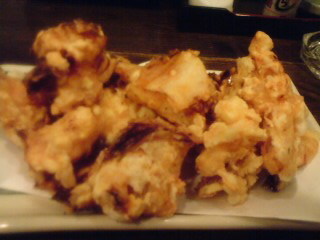 Talking of tenpura, Oikawa is famous for its “Kimchee Tenpura”, a very crispy and tasty invention of theirs! 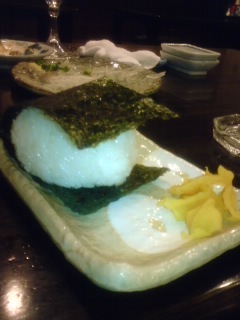 The “Musubi/rice ball” being enormous, I would suggest you to order them one at a time! Great traditional atmosphere and food, but the one reason I would take anyone there is their incredible range of Shizuoka Jizake! Shosetsu (1-Yui Cho), Masu Ichi (1-Shizuoka City), Hatsukame (4-Shida Gun), Isojiman (2-Yaizu City), Suginishiki (1-Fujieda City), Shidaizumi (1-Fujieda City), Kikuyoi (3-Fujieda City), Wakatake (1-Shimada City), Morimoto (2-Kikugawa City), Kaiun (1-Kakegawa City), Kokkou (2(-Fukuroi City), Eikub (1-Yui Cho), Fujinishiki (1-Fujinomiya City), Takasago (1-Fujinomiya City), and Sanwa (1-Shimizu Ku)! In recent years Shizuoka has witnessed the welcome resurgence of traditional izakaya thanks to a merry band of young(ish) restaurateurs such as the owners of Oddakui, Yasatei and Hana Oto (and others that I will visit soon!). They all prove time and again to be true exponents of traditional Japanese gastronomy by going back to the basics and caring about their patrons’ pleasure. These gentlemen and ladies (yes, you heard me right!) 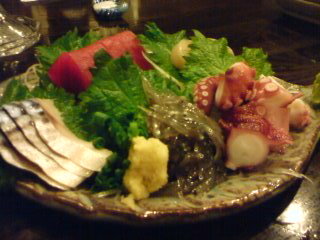 are not afraid to serve and promote local products, be they fish, meat, vegetables, sake or other delicacies. Unearthing Han Oto can become a small adventure in itself as it is tucked in one of those “dark corners” on the ground floor of one the most ancient buildings in the Ryogae-Cho district, the oldest haunt of Shizuoka night owls. 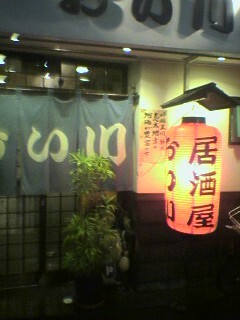 It used to be a “yakitori” until Yuusuke Tozaki and his younger brother, Keisuke, took it over in February 2004. Great fans of the famous sake manga artist Akira Ose (“Kurabito Claude”), they changed nothing, preserving the ancient and warm atmosphere, only adding their own little touches. Not only great sake including some jewels from Shizuoka Prefecture (Sugii, Takashima, Oomuraya and Kaiun Breweries for the moment) but also great shochu, including an extravagant real tea and rice shochu by Fujinishiki Brewery (Fujinomiya City) called “Chyakkiri Shi”! 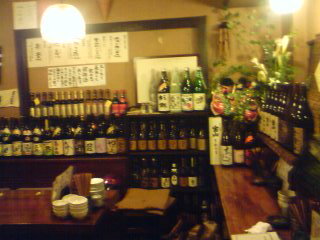 Of course all kinds of spirits, awamori, soft drinks and even wine are available. 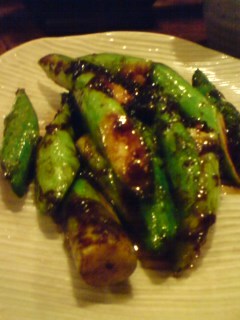 Now, Yusuke Tozaki has a special predilection for vegetables, especially from Shizuoka, and the enormous Shimizu Ku green asparaguses I was served sauteed with Chinese XO sauce were absolutely scrumptious! Foodhoe will want to fly there, I can tell you! Even a vegetarian would have enough reasons to patronize the establishement! 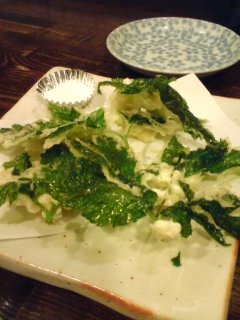 But before that, I had to taste a great Yamahai by Takashima Brewery in Numazu City with a little home-made pickled wasabi plant. I could have checked the menu, which is renewed everyday but I let the owner choose for me. Sashimi were absolutely fresh and delicious.Mind you, when you know the level of fish in this Prefecture it almost becomes a matter of course! 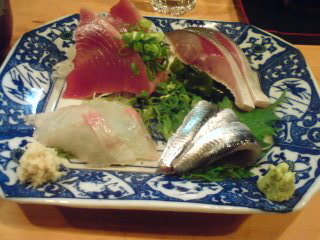 I was served “Mejimaguro tuna”, “Katsuo/Bonito”, raw “Tako/Octopus” and “Kurodai Seabream”. 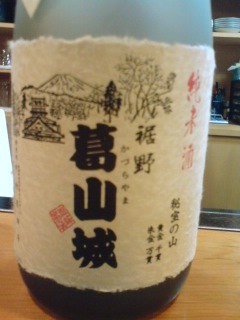 The first sake having disappeared without notice I savoured another great Yamahai by Sugii Brewery in Fujieda City. As I had another commitment I unfortunately had to depart, but the owner would let me go before I tried another beauty called “Tatsuhisa” by Eiku Brewery in Yui that was not on the menu for the simple reason that the owner’s private sake! Blimey, Gaijin Tonic would never leave such a place! I will have to convince Lojol to accompany me for a lengthier visit next time! Taste: Light junmai tingle, almost sweet at first. Bananas and pineapple. Short tail. Gets drier later inside palate. Bitter chocolate faintly appearing later with food. Overall: A delicate, elegant sake showing many facets along a changing character. Searching for answers. Pleasant. Drinks easily for a genshu. Calls for next sip. Would do well as a session sake. 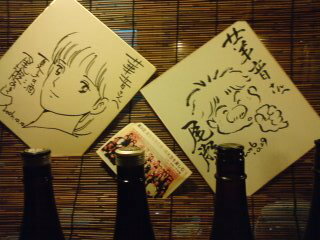 It was actually with some apprehension that I entered Sanwa Brewery in the company of my good friend Takahiro Nagashima. The only times I had been able to check beforehand the likes of Mssrs. Katsumasa Suzuki and Tomio Sugahara I had discovered extremely serious, almost severe faces. Photographs seldom do justice to people. In fact everyone in the brewery were extremely civil, smiling and welcoming. The ice was quickly broken and conversation commenced in earnest with Mr. Suzuki and his emplyee in charge of the borrling, Mr. Hiroyuki Sano, who later took us on the grand tour of the premises. Sanwa has a long and eventful history: founded in 1686 under the name of Oshikubai Brewery (Mr. Suzuki is the 19th-generation owner), it merged with two other local breweries 30 years ago. The original Oshikubai Brewery building serves as office and bottling and storage sites with 7 staff. The former Koizumi Honkei Brewery stretches at the foot of a very scenic mountain and comprises the brewery proper and private quarters, kitchen and dining room for the toji/master brewer and his 5 aides. The third brewery, Shimizu Brewery can still be seen as a private household halfway along the main thoroughfare. Sanwa Brewery is known for many brand names such as Shizugokoro, Hagoromo, Tesshu and Okitsukawa, but it achieved international fame of late after they created the Garyubai label four years ago. The name itself means “Sleeping Dragon Plum Tree”, and was inspired by a local legend whose history is related in nearby Seiken Ji Temple, a small but grand scenic spot adorned with plum and cherry trees. 90% of Garyubai brand is junmai. Water is gathered from the mountain standing at the back of the brewery. Yeasts are No 10 and M310. They also started last year to produce a very limited quantity of umeshu I cannot wait to get my hands on! Visiting the brewery is like taking on a tour of old Japan. Most buildings date back to before WWII. Old pictures from the Meiji and Taisho eras showing the rebuilding of the premises, an impressive range of cups, bottles and even crystal glassware. The toji, Mr. Tomio Sugahara is an impossibly gentle and affable craftsman hailing from Iwate Prefecture (Nanbu Guild) who never stops smiling. Mr. Sano confided me that he just cannot remember seeing him angry. Interestingly enough, Mr. Sugawara is a gradener back home during the off season. Equipment and structures are still very traditional with the necessary dose of automation to help reduce manual albor. You do have the impression of stepping inside Old Japan, especially when you consider that the no sign stands to indicate the brewery, which lays hidden in a very rural setting away from the bustling thoroughfare. 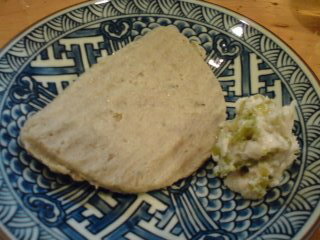 The large amount of kasu/white lees goes to local wasabizuke makers or sold to various gastonomic ventures. The collection of kasu is the only labour still done manually. It does take three days for the whole company staff to take it out of the vats and pack it away. Apart of producing some sake for private labels in Shimizu and as far as Tokyo, Sanwa Brewery exports to New York, Singapore and Hong Kong, where their barnd name, Garyubai, is steadily acquiring a respected name, including the International Sake Challenge 2007 Grand Gold Prize. Moreover, Sanwa Brewery is also very active in Promoting Shizuoka Jizake by holding an annual Dinner tasting Reception for 240 guests every third Friday of October at Elizabeth Hall near Shimizu JR Station in the company of three other breweries. You can bet I’ll be there next October! This particular sake was tasted by nationwide connoiseurs for the 2008 March edition of Dancyu if I needed any proof of its sublime excellence (oxymoron?)! It was exclusively made with Matsushita rice biologically grown in Fujieda City else to Aoshima Brewery. 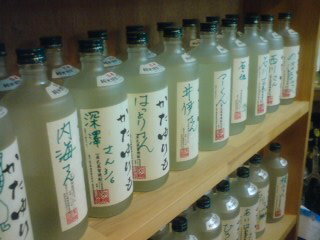 As the yeast is also from Shizuoka, you could not ask for a more local sake! Dryness emphasized with second sip and food. Coffee beans, bitter chocolate, almonds. Overall: Gentle and elegant sake. Very complex with multiple facets revealed along with more sips and food. Litlle junmai tingle. Turns dry on the palate. Simply extravagant. A very special drink for a very special moment with very special compny?